Harrowing and ultimately moving, Meru charts the efforts of three of the world’s best mountain climbers to conquer an “impossible” Himalayan peak that has never been successfully scaled before. There’s no lack of high drama here, with some of the most hair-raising developments taking place between the trio’s attempts to climb the titular pinnacle. While you might well leave Meru thinking it requires a degree of craziness to undertake such perilous tasks their personalities are nonetheless so relatable that the docu sports an unusually high degree of emotional involvement for an extreme-sports chronicle. 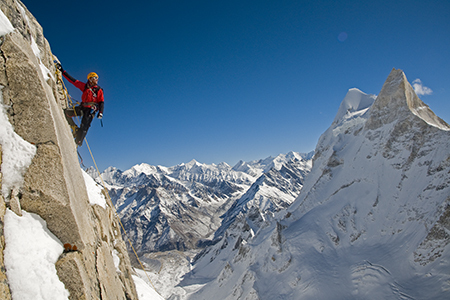 All climbing films deal with testing the limits of human endurance. It’s much less common to find one that successfully explores the psychological toll the mountain takes, and the type of personality able to overcome all the physical signs that it’s time to turn back. Meru will open your eyes, and more than once. Not just visually, as you might expect from a documentary on the obsessive quest to be the first to climb the most impossible peak in the Himalayas, but psychologically as well. Though the “Meru” climbing and outdoor footage is spectacular, it is the personal struggle of each of the climbers, and the candid way they talk about them on camera, that give this film its considerable impact.